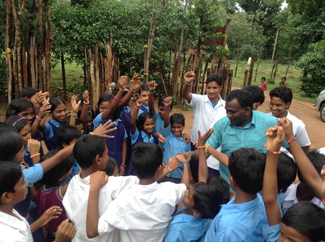 Rescuing Lives works with and operates several orphanages across Andhra Pradesh, India. The children at the orphanages are loved and cared for by house parents and caretakers. We keep a close relationship with the house-parents and caretakers of each facility. The children at Rescuing Lives orphanages range in age from 5 to aprox. 16 years of age. The children attend school regularly and are receiving an education that will help them succeed in life. They are provided with medical care, food, clothing, love and a safe environment in which to grow up. We enjoy visiting, ministering to, and playing with the children at the orphanages. Many of the children have heartbreaking stories of poverty, of being exiled from their families, of homelessness and being hungry, and of having no one to care for them and no one to turn to. Many of the children that live in the orphanages, if they would not have been taken in would have ended up in human trafficking, living a life as beggars in the street while foraging for food in the trash, or working for meager wages that would barely provide enough to live-much less an education to better themselves by. By God leading these children to one of our orphanages, they are being given a chance at a new life that would have never been possible to them. A life with an education, a life with a future, a life filled with hope. We would like to encourage you to not only pray for the orphans at Rescuing Lives orphanages but to also financially support the ministry to help provide for these children. For only $55 a month you can provide shelter, clothing, food, and an education that will continually change the life of a child and the children's lives within the orphanage they live in. There are several donation options for you on this page. You can donate by debit card or credit card as a one-time donation or as a recurring donation through the links on this page. Please contact the ministry if you would like more information on a specific orphanage or child that you may have met on a trip to India at one of our orphanages. At this time that information is kept private for the security of the facility and the children that we provide care for. The mission for Rescuing Lives is to support and care for the widows and orphans, and give them a hope and future through resources, training, and education. Rescuing Lives also endeavors to be a bridge between the needs of the diverse cultures in India. The Vision is for Rescuing Lives to be an effective fulfillment of the Great Commission in this generation. India, for many reasons too numerous to list, is a country hungry for the Good News. The areas that we are ministering in have proven to be successful, and also provide easy opportunities for Westerners to engage in and visit this part of the world, partly due to its strong link to the English language. Rescuing Lives currently supports widows and orphans in India that come from poverty stricken areas and areas that are high risk for human trafficking of children. If you are interested in additional information about the orphans and orphanages in India, you can contact our office at admin@rescuinglives.org.